The sheer volume of content produced nowadays makes it critical for both public websites and intranets to come with highly relevant search capabilities. As a result, today's enterprise search tools take synonyms into consideration, offer spelling suggestions, let site administrators manage weighted metadata, provide in-context search term highlighting, and rely on stop-words and stemming techniques to strip unnecessary "noise" from queries. Six Feet Up has been deploying custom search features for a wide variety of clients. The goal is to improve the accuracy and relevance of individual searches, as well as reduce the amount of time required to search for resources. Faceted search interfaces are especially helpful with large collections of data as they provide site visitors with a quick and intuitive way to narrow down their search results in real time. Federated search integration projects expand search capabilities to multiple data sources. This facilitates research by helping users find relevant documents in more specialized or remote corners of the Internet. 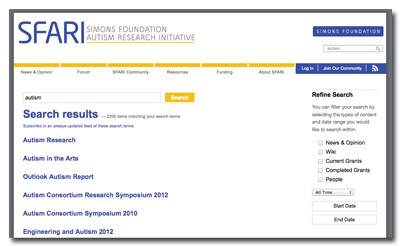 This makes federated search a vital technology for students and professional researchers. Six Feet Up has been using the widely-used Solr enterprise search platform to help our clients enhance online search. We are also adding enterprise search features to custom web apps like Pyramid through expert PostgreSQL database configuration work. Altering search mechanisms to influence the calculation of search relevancy and bring back specific content. Tweaking the online search machinery to focus on specific data fields. Customizing the search engine of a large pharmaceutical group's website aimed at healthcare professionals to give visitors quick answers to their questions, and abide by regulatory rules. Making custom search features available to subsets of web visitors based on both content workflow states and user's role. Customizing the number of search results allowed to return depending on the user's permissions. Changing the search results' order based on relevance, content type, title and last modified date. Ensuring that a specific content type is always returned first in the search results list. Enabling administrators to control which metadata is deemed more relevant for search result order. Deploying advanced search interface to give site visitors the ability to filter down their results. Providing a limited set of filters for specific user types. Allowing users to perform full-text searches of files, such as PDFs and Microsoft Office documents. Faceted search provides site visitors with a quick and intuitive way to narrow down their search results in real time. 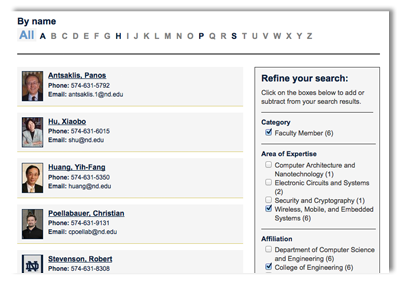 An A-Z navigation allows users to quickly jump to a list of profiles based on members' last names. A faceted navigation lets visitors refine the data by narrowing down in real time the results based on "Staff Category", "Area of Expertise" and "Affiliation". 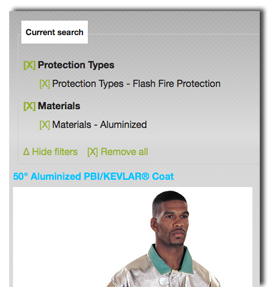 Steel Grip's online product catalog features a sophisticated faceted navigation system that encourages web visitors to browse through categories by easily narrowing down or expanding search results in real time without having to go back to a previous page. 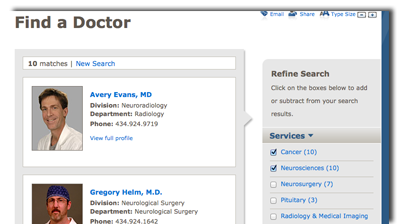 "Find a Doctor" allows visitors to narrow down the list of doctors by one or more Specialty, Languages Spoken and/or Gender using a faceted navigation system. Thanks to a Google Maps integration, finding locations is greatly simplified. 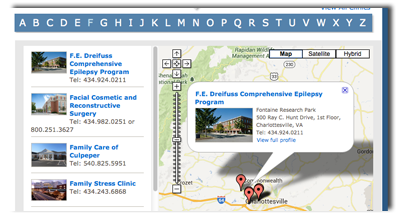 When used in conjunction with the "Quick Search" and the A-Z navigation, visitors can shorten the list of clinics to the left of the map by searching for a service provided, street name, location title and more. "Search Conditions & Treatments" allows visitors to jump to a condition or treatment based on the first letter using an A-Z search. The intranet facilitates access to their expert roster through a faceted staff directory. Users can narrow down the results based on last names using the A-Z navigation, and then further refine data by filtering by expertise/skill, regions and availability. Federated (or distributed) search addresses the need of searching through multiple and disparate content sources with just one query. Six Feet Up and UCLA have co-developed PushHub, a mechanism that makes it possible for hundreds of site to contribute content to a hub and make that content available for syndication to all the other sites. This is now even possible across Drupal and Plone websites. The Steel Grip site is powered by a search mechanism that pulls data from both the ecommerce website solution Shopify and the open source CMS Plone.